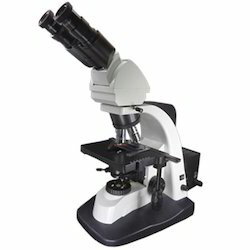 Manufacturer of a wide range of products which include research microscope, pathological research microscope, research binocular pathological microscope, binocular pathological research microscope and advanced binocular research microscope. 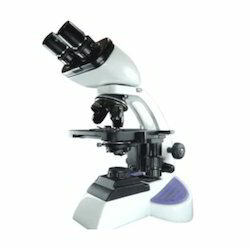 Being a prominent name in the industry, we are delivering perfect quality assortment of Research Microscope to our valued customers. These products are manufactured by a pool of brilliant and experienced professionals with utmost sincerity and hard work by considering only optimum quality components. They are easy to install and highly appreciated for its attractive features. Our client can easily avail this array of products at very cost effective rates. Magnification : 40x - 1000x for visual observation. Coarse & Fine focusing : Coaxial coarse and fine focusing with cross roller guide for smooth operation, fine motion 2 m per rotation with maximum 2 micron scale increments. 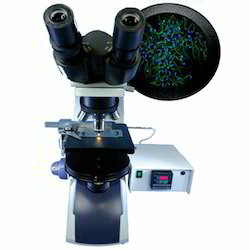 We offer a wide array of Pathological Research Microscope, which is easy to install and requires minimal maintenance. Designed under the supervision of skilled professionals, the offered products are appreciated by customers not only for their excellent performance and easy to use controls, but also for a good operational life. Further, we offer these products in various models. Division: 0.1mm Low drive right side movement controls. Coated surface for scratch resistance. Double specimen holder clip. Condenser: Abbe condenser NA 1.25 with aspheric lens. Iris diaphragm with Frosted white filter, antifungal & antireflection coated. Rack and pinion movements on stainless steel guides. Illumination: maximum 2 micron scale increment. Electronics: Koehler Q-LED 3.5W 3V illumination with variable control. Up to 100,000 hours of LED life. Universal input 110V - 240V AC, 50/60 Hz. 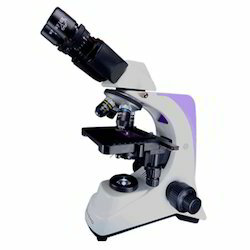 Our clients can avail from us best quality Research Binocular Pathological Microscope. Our talented team members work in close coordination with clients for analyzing their need and thus offer best performance solutions. 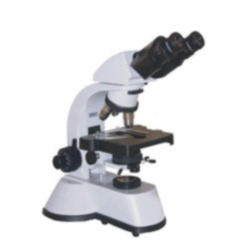 These offered microscopes are appreciated for timely delivery and errorless performance to the valued clients. Apart from this, client can avail these products at reasonable prices. Optical System: Plan / Achromat optical system. Magnification: 100x - 1000x for visual observation. Eyepiece tubes:Binocular tube, Sidentopf type (30°, IP distance 55-75mm, 360° rotatable). Eyepieces: WF 10x (F.O.V. 20 mm) & Centering telescopic eye-piece. Nosepiece: Quadruple nosepiece, reversed type. Stage: Rectangular142 x 120 mm surface stage mounted on the main body cross travel 130 x 50mm using low-positioned X/Y coaxial control knob. Mechanical Stage: Graduated Mechanical rectangular stage, size 140 x 140mm with cross travel 90 (X) x 65mm (Y) on ball bearing with co-axial controls. Focusing Movement: CO AXIAL coarse & fine focusing mechanism, with tension control ring. Ergonomically designed for easy grip, esp. for tension control. Light Source: Illumination system LED 3.5W 3V with intensity control regulator, Universal power supply 110V - 240V, CE approved. Optional Accessories: Wooden carrying case, Trinocular Head, QVST series DIN Plan objectives 20x, 60x SL, WF 15x,WF 20x,Pointers & Micrometer Reticules, Phase contrast, Polarizing, Fluorescence and Dark Field attachments, Digital USB Cameras (1.3MP,3MP, 5MP, 14MP) with in-built adaptors, Digital Cameras and DSLR Cameras with adaptors, Illumination System Halogen 6V 20W. Optional Accessories: Wooden carrying case, Trinocular Head, QUSP series DIN Semi-Plan objectives 20x, 60x SL, WF 15x,WF 20x,Pointers & Micrometer Reticules, Phase contrast, Polarizing, Fluorescence and Dark Field attachments, Digital USB Cameras (1.3MP,3MP, 5MP, 14MP) with in-built adaptors, Digital Cameras and DSLR Cameras with adaptors, Illumination System Halogen 6V 20W. 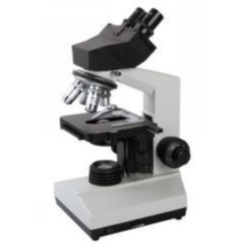 Owing to a pool of well qualified professionals of this realm, our organization is immersed in offering a broad collection of Advanced Binocular Research Microscope. These products are highly used in the medical industry for the research purpose due to their longer service life and minimum prices. The offered products are manufactured by highly skilled professionals, who have prosperous acquaintance of this domain. Our clients can avail these products from us in various technical specifications at nominal prices. Light Source: Illumination system LED 3.3W 3V with intensity control regulator, Universal power supply 110V - 240V, CE approved. Optical System: Infinity Plan optical system. Magnification: 40x-1000x for visual observation. (Inclination 30o interpupillary distance 52-75mm, 360o rotatable). Stage: Rectangular 190x 140mm surface stage mounted on the main body cross travel 90x55mm using low-positioned X/Y coaxial control knob. Objectives: Infinity Plan achromatic 4x N.A. 0.10, Infinity Plan achromatic 10x N.A. 0.25, Infinity Plan achromatic 40x N.A. 0.65, Infinity Plan achromatic 100x N.A. 1.25. Condenser: Abbe condenser N.A. 1.25, Leaf-type aperture diaphragm with position guide. Illumination: 6V/20W halogen bulb or 3.5W 3v LED lighting system.